Our Manufacturers for these Products serve the electronics industry, specifically, telecommunications, aerospace, computers, medical devices, instrumentation, commercial electronics, government and military. Their product line primarily consists of gaskets, elastomers, and air ventilation/filtration panels. These products reduce or eliminate EMI/RFI “noise” associated with electronics and are usually installed in or on the enclosure or cabinet that contains the working electronics. The electronics may be as small as a hand-held telephone, or as large as a satellite communications array, or even larger. The manufacturing facility is capable of medium- and long-running production. Always striving to exceed the customers expectations, they provide prototyping, customizing, and flexibility in scheduling in addition to quality products. Air Filtration Panels are used in the manufacture of electronic cabinets, shielded rooms, mobile control stations, or in these cabinets, which requires a interference shielding. These panels are used in electronic cabinets, control cubicle and shielded rooms of every size. Multicon Material is a combination of silicone an conductive paths to provide a superior environmental seal and EMI/RIF shielding. Multicon is used in high pressure requirements using silicone and low pressure requirements using sponge silicone. Pressure sensitive adhesives can be attached for a simple processing. Elastomer shielding strips are used as seal for admission openings and doors by electronic cases. The application requires a low closing pressure. Pressure sensitive adhesives can be attached for a simple processing. Knitted wire netting seals offer an effective EMI shielding and are used also as earthing seal. 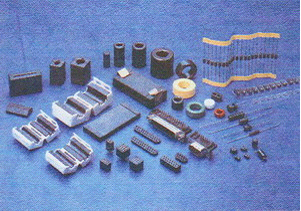 This material is used mainly in electronic cases and is fitted in into the chases intended for this. Pressure sensitive adhesives can be attached for a simple processing. 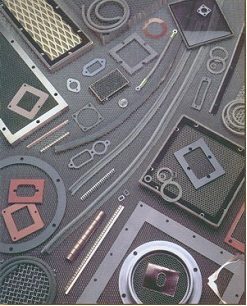 Seal frames find use, where airtight closure or sealing against environmental influences with an EMI shielding can be combined. The material is used as cover of ventilation panels, admission openings, doors or other areas. Pressure sensitive adhesives can be attached for a simple processing. Rigid frame seal as an EMI/RFI filter consists of an extruded aluminum frame with a special designed groove. When installing the flexible wire netting is held to the EMI shielding firmly included and exactly. This construction is recommended for large cupboard doors or frequently used admission openings. EMI/RFI earthing slices which are pressed in a mold with very narrow tolerances to a solid slice are produced from knitted wire netting. These earthing slices are in different thickness's and diameters' manufactured around much requests. These strips of silver coated nylon are ideally suitable for high effective applications at low preassure. They offer protection against dust and other environmental influences and they are flame-retardant. Elastomere can be manufactured in almost every geometric form.